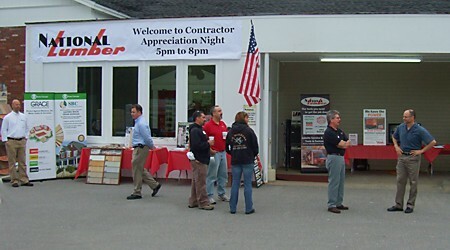 National Lumber’s Contractor Appreciation Night events are always a great success, and it was no different at our Boscawen, NH location on the evening of June 9th, 2010. Over a hundred New Hampshire contractors and other guests came to enjoy free food and presentations by top quality vendors. You can view pictures from the event in our Facebook photo album. Become a fan of us on Facebook or follow us on Twitter to be the first to learn about National Lumber’s future events! You can also sign up for our e-mail list through the National Lumber website to be invited to the next event.